And, as if by magic, I have a new job. Less involved, less senior, and not entirely on-path; but better paid, more interesting and without any commute at all. This week will be my last week at ELS, and I’m trying hard not to check out. I’m handing over projects, moving code out of my private area on our git servers, creating lists of accounts I have that need to be deactivated, attempting to empty my brain of Company Information into wiki form. Three point five working days remaining. I’m now up to two tabletop games in active play. A D&D dungeon descent, and an arctic adventure of aberrant abominations. Both the same day alternate weeks, but fortunately tessellating ones. They’re both fun, though wildly different in style and play, and I keep meaning to write up a couple of diary entries. Partly to keep my characters’ state in my head, but also for fun. I’ve not had much computer gaming time this last fortnight, the uptick in my sociality has put a dent in my dedication, but I’m still working through the most recent World of Warcraft expansion’s new areas. I fell out of Factorio shortly after that diary entry – as a friend predicted, the requirement to entirely rebuild large parts of my factory to keep up with new inventions got wearing. I need to ration new games for a little while – new job has a pay-cheque gap – so it may be a good time to go through my steam list and try to complete some things. So, this weekend I lived Happily Ever After, a larp based in a world where Fairytales come to the real world. Somewhere on the axis of Fables and Once Upon A Time. I went in with a mixture of excitement and apprehension. 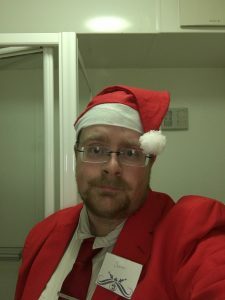 I had a long-running NPC role (Father Christmas) but didn’t really have a handle on how to play him, and was hoping it evolved in play (it didn’t, really, I got some lovely moments, but never really found a place. Still a fun role, and now I need to find another use for a bright red suit…). However, the bit I was more worried about – the kind of actual monstering respawning-gribbly roles I haven’t really done since CUTT – was far more fun than I ever hoped for. I’m massively out of practice in LARP fights, but even with three to five of us respawning against a 30+ character party we managed to cause enough chaos to keep it fun. Especially, I loved playing a Large Ham Grail Wizard, Declaiming every sentence and attempting to turn the quest for the holy grail into the Epic Tale it probably should be. Plus, I very nearly killed Peter Pan as a protester, attempted to behead Rumplestiltskin as a Wonderland playing card, and got to – as Santa – tell Captain Hook there wasn’t enough coal in the world to get them a present. And what more can you ask from a weekend? This weekend was the Durham Treasure Trap banquet. I’ve been wanting to attend this for a while, but the last couple of years had to pull out at the last minute. 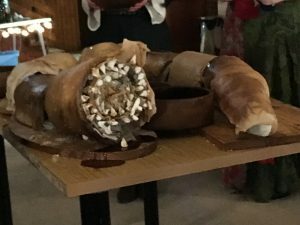 The event was a lot of fun, the banquet itself was amazing (The centrepiece – pictured below – was a giant worm filled with slow cooked pork was delicious, and the beer-baked salmon and armoured turnips were highlights) although the logistics, time and expense of getting up to Durham for an evening was somewhat excessive. I suspect that if I did it again, it would be part of a longer trip either to Durham or as some kind of Northern Invasion. It was nice to see people I only generally get to talk to in character or in passing for a more social event, though. As alluded to above, this year – escalating the last six months – I’ve increased my actual non-work-based human contact significantly. 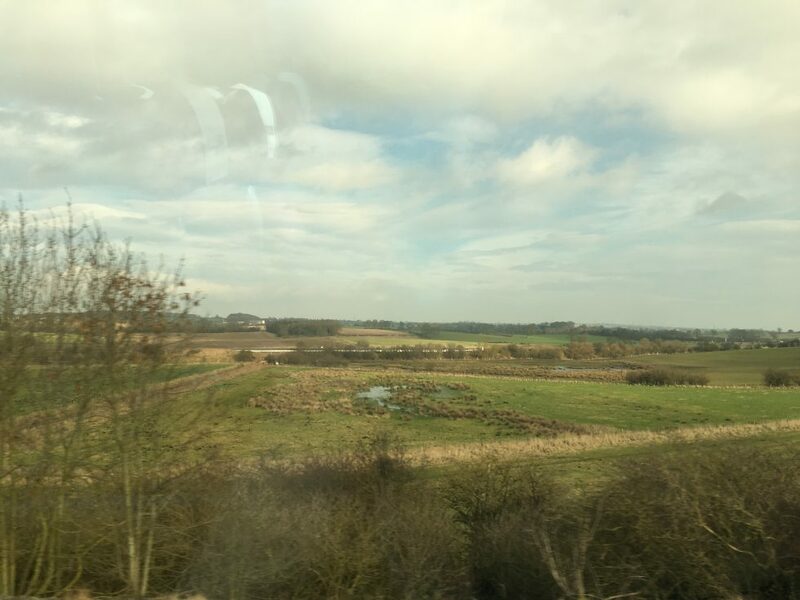 The advantage of moving from London is that casual social has become a lot easier to arrange (the distances are smaller), but Oxford’s lesser status as a public transport nexus means it’s harder to go see friends who don’t live here. I’ve not managed a weekend this year without some kind of major social thing, which is mostly good, but somewhat exhausting. Next weekend is ring-fenced as “Do not schedule”, and I’ve got the week after that off to fix bits of my life that have been neglected this year, like my company and mountainous piles of post and pending laundry.